The East Union Mennonite Church (Mennonite Church USA), located at 5615 Gable Avenue SW, Kalona, Johnson County, Iowa, was organized in 1884 under the leadership of Christian Warey, having come out of the large Old Order Amish settlement in this locality. It first met for worship at the Prairie Dale schoolhouse, 1 1/2 miles west of the present location, and was known as the Union Church. Christian Warey was ordained bishop the following year, with Jacob B. Yoder as deacon. Others who have served as deacon, minister, or bishop up to 1950 are A. J. Yoder, Jacob J. Schwartzendruber, Jacob S. Yoder, Fred Gingerich, S. C. Yoder, A. C. Brenneman, Harold Brenneman, and Edward Shettler. The present church was built in 1922, and was the largest Mennonite church of its branch west of the Mississippi in the 1950s. The ministers in 1955 were D. J. Fisher, bishop; A. Lloyd Swartzendruber, assistant bishop; J. John J. Miller, minister; and Henry H. Miller, deacon; the membership was 565. Swartzendruber, A. Lloyd. "East Union Mennonite Church (Kalona, Iowa, USA)." Global Anabaptist Mennonite Encyclopedia Online. 1955. Web. 20 Apr 2019. http://gameo.org/index.php?title=East_Union_Mennonite_Church_(Kalona,_Iowa,_USA)&oldid=126571. Swartzendruber, A. Lloyd. (1955). East Union Mennonite Church (Kalona, Iowa, USA). Global Anabaptist Mennonite Encyclopedia Online. 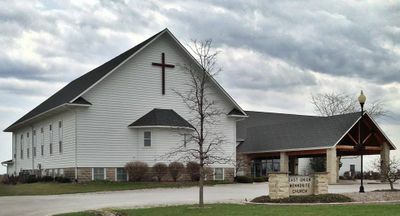 Retrieved 20 April 2019, from http://gameo.org/index.php?title=East_Union_Mennonite_Church_(Kalona,_Iowa,_USA)&oldid=126571. Adapted by permission of Herald Press, Harrisonburg, Virginia, from Mennonite Encyclopedia, Vol. 2, p. 130. All rights reserved. This page was last modified on 27 October 2014, at 14:21.